So you want to do content marketing – and in a big way. This isn’t going to be a tentative test. You’re making an aggressive, committed, all-in push to create and engage an audience for the long-term. First of all – good for you! Content marketing is effective, and increasingly more effective than advertising. And as it gets harder and harder for advertising to work, we expect more companies to make serious, committed shifts like this. But now that you know you’re serious, you’re going to need to hire people. This assumes, of course, that you’ve decided to keep this thing in-house rather than hire an agency. Good content marketing involves the entire company – sales, customer service, management, even accounting and development. An in-house team will always have better communication channels with those departments than an agency will. You’ll see each other in the elevator, at the Christmas party, and at any other company-wide function. There’s no question of everyone being “on the team” with an in-house content program. This isn’t always so with agencies. There are sometimes lingering questions about what an agency’s priorities really are. Great content marketing rises up from your company’s DNA. Your brand voice, your value proposition, your understanding of your customers… these are so core to your company that I worry about hiring an agency to define it for you. 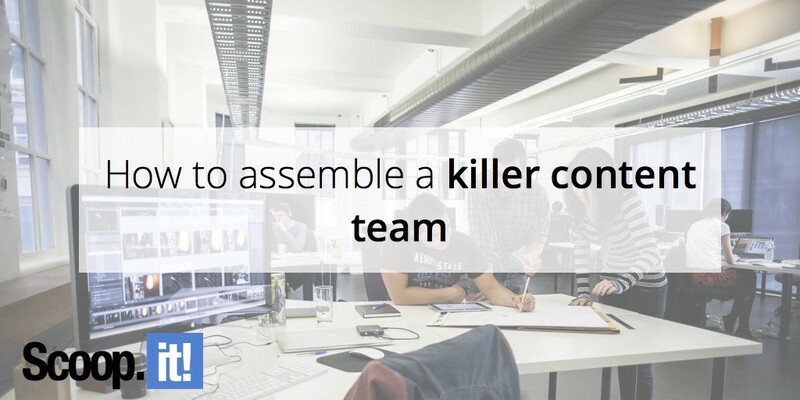 With the agency thing settled, you now need to go build your team. The question becomes: What are your goals? What’s your budget? Those answers will inform how big of a team you’ll need and who you’ll hire first. Great start. But even this can be a pretty big investment. If you really want a successful blog that actually drives business, you’ll probably need to hire a Content Manager. Wrangle writers for you. Good, reliable bloggers who know your niche and industry and can talk to your audience in a way that’s worth listening to. They’ll take the content from those bloggers and make sure it meets current quality standards. This ensures your blog is professional and – above all – trustworthy. They’ll hire a designer (or do the work themselves) to add header images and other visual content. If you can’t afford to hire a designer for them, services like Undullify or DesignPickle can get images made. They’ll set up the posts in WordPress. This will also require a bit of SEO knowledge, but plugins like Yoast can help. They’ll set up weekly emails or one-off content updates to go out weekly or biweekly. They might also use a tool like Scoop.it Content Director to add some curated content to the emails. They’ll manage all internal posts and writers. Often, departments want to write a post about a new product or event. This is good, and should be on the blog, but it’ll need some work to turn it from a company announcement into something your audience might actually want to read. This is where the skills of a genuine Editor come in. If necessary, they’ll be able to take a bare-bones press release and turn it into something worth sharing. This part of the job may also require saying no to people from time to time. So make sure your Manager/Editor has a backbone. They’ll need it. They’ll be able to reach out to influencers and subject experts to get some guest posts on the blog. It’s important to have a variety of voices on a blog, so a Manager/Editor with contacts in your industry is a big plus. They’ll find the time to take your top-performing blog posts and convert them into ebooks, videos, infographics, and SlideShares (and more). They’ll use these to generate leads, but also to get your content on more platforms (and thus in front of more eyeballs) and to get you out of the “text only” box that too many content marketing programs fall into. (I know.. you said you only wanted a blog… but if you want a profitable blog, you’ll be smart and use it as a content and business-generating machine). They’ll also be responsible for promoting the content, though hopefully services like BlogPros and some advertising budget can help them. They’ll create and schedule social media posts for every piece of content published, then re-share the content at regular intervals. And they’ll respond to comments, customer questions and do some community engagement on social media, too. They’ll know how to slice and dice analytics reports well enough to know which content is performing best. And to know which platforms are generating the most business. They’ll also have to be aware of new technologies, platforms and tactics. And they’ll need to stay on top of things enough to have time to step back every six months or so to do a content audit and to ponder your near-term and long-term strategy. The strategy part will probably be coordinated with your Marketing Director. Sound like a lot? It is. An awful lot. A job description like that is why we recommend content curation, marketing automation, outsourcing, and smart tools – basically, every trick in the book for productivity and optimal use of resources. But as daunting as it looks, most content marketing programs are usually made up of one person. This is what the typical content marketing program looks like. So if you want to shift from a one-person program to a full-on content marketing team, where do you start? Typically, it’s to take on a full-time writer. There’s so much content to be created (and re-created, and updated) that it’s easily a full-time job or more just to focus on content creation. A good content creator might also be recruited to do some editing of internal blog posts, too. Your new writer / editor will also take on the considerable work of reformatting existing content and getting it updated when it’s more than a year old. Next is the whole social media side of the world. This is so intricately linked with content promotion that you could well have a hire dedicated to just these two areas. Someone to be a “community manager” to grow and engage your social following. But who’s also responsible for the bulk of content promotion, including sending the emails out. This person gets bonus points if they can also organize and host webinars, Twitter chats, and events. Now that you’ve got three people, your Content Marketing Manager’s job shifts a bit. Ideally, they’ll begin to become a more visible face of your brand. They’ll start appearing at trade shows, start guest posting on major publications, start co-hosting webinars with partner companies and influencers. And they’ll hopefully spend more time and gain more influence with your executive team. And – in their spare time – they’ll think and write and plan your content strategy. The biggest remaining gap by now is the technical side of things and the analytics. Up until now, you’ve probably been leaning hard on IT to help with your website and to get the tracking for your campaigns to work. If you’ve been doing much testing, you may have been borrowing their services for that, too. As you scale up, this support may become a burden on IT. They may complain about it. That can cause strain (to say the least)… and can create problematic work backups that leave your whole department in a holding pattern. This is why a technical person is usually the next hire at this point. You may find you cannot up your game until you can free yourself from the constraints of your IT department. They have their own list of priorities, after all. And for good reason. So what to look for in this hire? All the things you’ve been asking IT to do for you, basically. It’s great if your new developer has a little testing background, too. They need to value the user experience and understand conversion rate optimization. Often, developers may not have advanced analytics skills, but they tend to be analytical people. They also understand how the tracking works – so even if your Content Marketing Manager is still the one scrying your reports, at least you’ll have trustworthy information for them to review. It’s great if this analyst / developer can take over some of the job of “which content is working?” Where is our business coming from? What’s working to improve loyalty? Referrals? Lead generation? They are, basically, the point person for results. But if you want them to solely focus on development work, you could use a tool like Scoop.it Content Director to get you that information, too. The best choice for your next hire depends on your objectives. Want to make a major investment in video? Then you’ll probably want to hire a video specialist. Want to get more sophisticated with strategy? Then you’ll hire a strategist. Want to get more search engine traffic for the long term? Hire an SEO. Simply want to publish more content, promote it better, and optimize it for all it’s worth? Then you might want to hire a few more freelance writers, maybe bring someone one to do nothing but content promotion. Or it could be way past time to bring on a full-time designer. They can be a huge help with converting your existing content into visual formats. Occasionally, designers also have video chops, which can be really helpful. A lot of the decisions here will also depend on your original Content Marketing Manager. You may want to hire around their strengths. Or it might make better sense to promote them to full Content Director and give them an assistant/deputy with the title of Content Marketing Specialist. Your original writer/ Managing Editor may also want a promotion so they can become an Editorial Director. Especially if they are now managing more than four or five writers. You’ll have gone from a team of four to a team of seven. That’s much larger than even some of the most visible content teams in the industry. It’s enough people to “make a dent in the universe” if you’ve hired well. Scale up, or start fully staffed? Start with a Content Manager and grow from there. Hire the four core people all at once (Content Manager, Editor, Community Manager, Developer). Go from zero to sixty: Hire the seven employees I mentioned above, plus maybe even one or two more based on your goals for your program. Even if you have an unlimited budget, I’d be careful about hiring more than seven people at a time. That’s a fairly large content team. If it is scaled up, it should be done carefully, and with real-world experience of how your particular content machine works. You won’t really know where your hiring gaps are until your machine is up and running. If you choose the growth path (starting with one hire, or maybe the core four people) by the time you’ve hit seven people, you should know plenty enough about what you’re doing and what you need help with to know where to fill the gaps. Doing full-time content promotion and audience engagement. You’ve probably heard of how every hour of content creation should be matched with content promotion, right? Well, if you follow that advice, then you need a full-time content promoter for every full-time content creator. Doing strategy and analysis to make sure every piece of content is on strategy and generating results. This could go all the way to researching competitors’ content and finding their content gaps, plus the gaps in your own content. Then there’s split-testing of landing pages, forms and every other step of your sales funnel. Plus all the strategy involved, from your company’s mission statement to making sure that mission statement carries all the way through to your editorial calendar. We’re big on lean strategy here at Scoop.It. It supports an agility that marketing and business tends to benefit from. But it also makes for accountability and a results-driven culture. Content marketing needs all it can get of both those things. Who was your company’s first content marketing hire? Who got hired after that, and why? Share your thoughts about all this in the comments. And if you want to get 30 effective techniques to master content marketing along with valuable insights from 10+ influencers like Mark Schaefer, Rebecca Lieb, Lee Odden, Jason Miller or Ian Cleary, download our free eBook now!